The body and the spirit that flows through it, is generally born with the possibility of natural growth and health. The spine is the body’s support. It should not just be erect and strong, but also flexible and supple. The back literally holds the body together and protects the soft inner organs by its support, and the spinal cord is physically the main channel for the central nervous system, dispensing information between the body and brain. It is also here that the psychic energy gathers in centres (Chakra). The body’s posture is not only physical, it also conveys something about your energy state on a deeper psychic plane. It ought to be unnecessary to practise yoga, but yoga allows the body to regain its natural form. A daily yoga programme gives an all-round effect, so that you are physically and mentally at ease, and thereby function better – also socially. There are many yoga poses that have a particularly favourable effect on the spine. It is best, though, to prevent back problems, and that can be done by a regular yoga practise, either on courses or independently. Not everybody considers prevention of back problems. Many only notice the back when there is something wrong with it. With severe back pains, only simple yoga exercises should be done, in a gentle and easy manner. It is not the point to do the exercises so well that it hurts. It is more a question of using the back differently from the habitual and unconscious patterns of movement. The body’s ability for self healing is thereby strengthened, and the back becomes flexible and supple. See the small tension releasing exercises on page 32 in the book: Yoga, Tantra and Meditation in Daily Life, by Swami Janakananda. There is also an entire yoga programme dedicated especially to the back in the book. It consists of ten exercises that give the back a general and thorough work-out and maintenance. A yoga programme for the back can also be shorter. In the example given here, there are five exercises that, with regular use, can prevent a bad back and relieve minor back pains. Stand with the legs slightly apart. Slowly let the head, shoulders and back sink forward and down, until the entire upper body hangs under its own weight. Keep the legs straight. Stand for 3-5 minutes and notice how the body, little by little, relaxes and sinks further down. Be especially aware that you do not tense anywhere or unconsciously hold back the body. It is easy, for example, to forget to let go of the head, arms and shoulders. Allow the head to hang completely loose and relax the face muscles. If you experience a tension or a pain in the back or legs, then don’t strain against it or think of something else, or bend the legs. Go into and experience the pain from within, experience the pain in a relaxed way – after a few minutes, you will find that the pain subsides or disappears. Then raise yourself up slowly, and in the end, stand completely still with closed eyes. Experience the whole body from the soles of the feet to the top of the head. Lie on the back on a mat. Bend both legs and clasp the hands around them. Begin to rock gently from side to side. You should not rock completely over to the side, just so far that you can feel that the small of the back has contact with the floor. Feel how the back is massaged. Continue for about a minute. Lie still for a moment with bent legs. Then roll forward and back. You roll all the way up to the neck, and quickly all the way down so that the feet touch the floor. After a couple of times backwards and forwards, try to lift the buttocks up off the floor, so that you stand on the feet before rolling backwards again. Continue for a minute. Lie still with straight legs. Feel the back and the whole body. You lie full length on the back. Place the sole of the right foot on the left knee. Lay the left hand on the right knee. Press the knee all the way down to the ground on the left side. Now raise the right arm diagonally upwards, so that the armpit is opened completely. Let the arm sink slowly towards the floor on the right side, and turn the head towards the right hand, so that you can feel the spine is twisted from top to bottom. If you cannot get the shoulder all the way to the ground, then allow the arm to just hang freely in the air. Absorb yourself in the pose now, and accept that it tightens and stretches the body. With every exhalation, let the right arm, if possible, sink further down towards the floor. Relax the whole body and remain in the pose for 3-5 minutes, or for as long as you can remain relaxed in the pose. Come calmly back to the initial position on the back. Lie still for a moment. Do the pose to the other side. Roll over on to the stomach and take hold of the opposite elbows with the hands. Pull the arms into the body, so that the upper arms are vertical on the mat by the chest. Without moving the elbows or knees, raise the buttocks into the air and move the body backwards. Continue this backward movement until the chest presses as far down towards the floor as possible, and the back has the greatest arch. 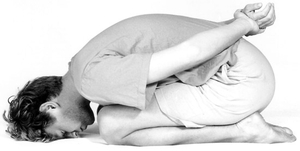 If you can come all the way down into the pose, place the chin on the floor, otherwise raise the head and look as far up as possible. Lie in the pose for about half a minute while the body calms down and relaxes. Roll slowly forward again back to the stomach, and straighten the arms out over the head. Rest until you are ready again. Do the pose three times. Sit in a kneeling position. Take hold of the right wrist, behind the back. Slowly lean forward, so that the head comes forward and touches the floor. If the head does not come all the way down, then spread the knees a little bit. Remain completely still. Do not be concerned with anything else, but remain with the body and feel it. When the body becomes accustomed to the pose and the breath has become calm, feel the navel area. Keep the awareness around the navel area. Remain motionless for 3-5 minutes, or a shorter time if you are a beginner. Calmly come out of the pose and straighten up the back and head. Feel how straight the spine is. When you have sat for some time, be aware that you can straighten the back even further. Meet the thoughts and states in the mind that prevent you from sitting completely erect. Remain sitting until you experience total harmony between the body and mind. As a yoga teacher, I often come across students with pains in the back or neck. If I have not been informed of it beforehand, then it quickly becomes evident when I see how the student practises yoga. Once in a while, a student phones to cancel a class due to pains in the back. I always recommend that the student comes anyway. If it is not possible to do some of the exercises, then the breathing exercises and deep relaxation (Yoga Nidra), will give relief. People often believe that they should be perfect and skilful at doing yoga poses. In due course, they realise that it is by their own experience, that they learn to use yoga as a tool to work with a strained neck or pain in the back. Whilst writing this article, I had to go to Helsingborg, Sweden, to teach a group of social workers. I am always picked up by one of the participants at the ferry terminal. During the drive, my student told me that the previous week, she had a pain in her neck for several days but after the yoga class that week, it disappeared completely. The funny thing is that she only noticed that the pain was gone several hours after the class. Another time, a 35 year old man came to a private lesson at the school in Stockholm, with severe back pains. He had been in the USA and had taken up aerobics mixed with yoga, and due to a lack of awareness and pressing himself too hard, he had unpleasant pains in the back. At that stage, he had had back pains for five years, and said he would be very happy if a yoga course could only make it a little bit better. He learnt various yoga exercises, which he also used at home, and each week the pains diminished. After coming to the class four times, the pains were gone completely. “My first experience of the effect of yoga on my back, stems from the time when I was a bricklayer’s apprentice and got back problems. I cancelled treatment with a physiotherapist to go on a course at Håå… Well, I came to the course, nervous and unsure, as it was my first course at Håå, but the place and its atmosphere made me relax quickly and feel OK as I was. It was in the meditation classes especially that I noticed the effect on my back. After the physical yoga had loosened the worst of the tensions, the meditation took over. The pain disappeared slowly, and during the meditation I could feel how my back straightened itself out. The hips gave a little, the small of the back got a natural sway to it, the chest straightened out, and I could hear how the joints yielded. It was especially, but not only, the meditation Ajapa Japa that had that effect on my back. I sat there and followed the guided meditation, while the body straightened itself out, the back became erect, the shoulders fell into place, the neck and head became a natural extension of the back and I felt that I sat in a perfect meditation pose, effortlessly and without problems.